Cast members of the 87th Waa-Mu Show perform. This year’s show will focus on unheard female voices, including those of female NSA decoders during the Cold War. Coincidentally, a similar saga of creative collaboration occurs behind the scenes of the Waa-Mu Show every year. Restieri said between 150 and 200 students worked on the entirely student-written show, which opens Friday and will run through May 13 in Cahn Auditorium. 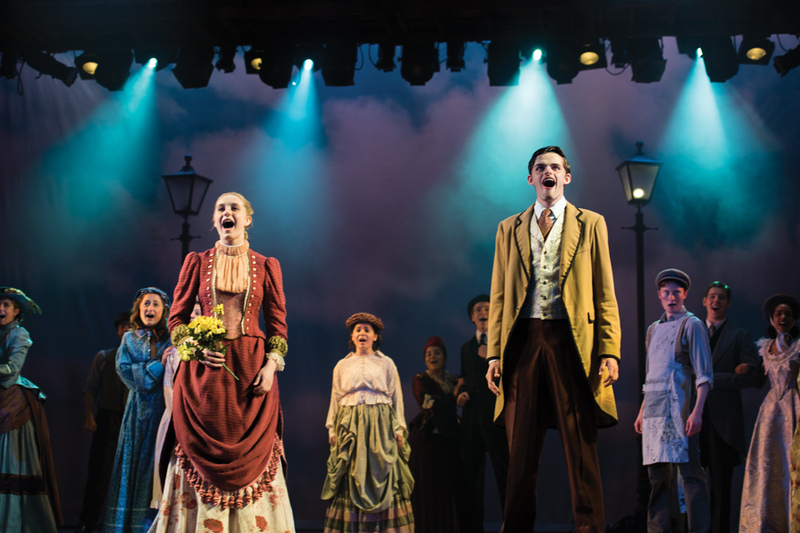 The show is a work of historical fiction and takes place in 19th-century New York City. After a tragic fire, a visiting Parisian ballet and opera company is forced to merge with a failing melodrama at a local theater. The brainchild of the two troupes, “The Black Crook,” is widely regarded as the first-ever book musical, the co-chairs said. Communication senior Sarah Ohlson, another one of the four Waa-Mu co-chairs, said the production is truly all hands on deck; as a co-chair, she worked on everything from ensuring continuity in the script to dabbling in songwriting for the first time. Communication senior and Waa-Mu co-chair Maxwell Beer described a similar experience, saying that even though he was a head writer last year, he briefly joined the crew when it was short a member. Beer said the group made some major changes to the show as recently as Winter Break, when they wrote a “massive” full company number. Ohlson said the turnaround from writing to rehearsal is extremely fast; of the two songs she wrote for the musical, one of them was finished just two weeks ago. While Ohlson joked that “crowdsourcing creativity seems like an impossible task,” she said the music team managed to pull off a final product that is true to the jazz style. Communication junior Gabriella Green, choreography co-chair and ensemble member, said the music and choreography of the show are “anachronistic.” Though the original production of “The Black Crook” took place decades before the rise of jazz, the stylistic aspects of “Manhattan Miracle” allude to how musical theater would develop in the years to come, she said. Green said “Manhattan Miracle” is the most challenging Waa-Mu Show she has been a part of in her three years at NU, primarily because it is particularly difficult to learn music and choreograph dances in the jazz style. The period’s costumes also pose a challenge to the cast. Green said the women in the show dance wearing “20 pounds of skirts and corsets.” Despite that, she said it was “pretty magical” to see everyone rehearse in full costume. Beer said every aspect of the show is best described as “grand,” from the elaborate costumes to the dynamic set, which is designed to look like the interior of an old-school theater. Even the instruments featured in the orchestra harken to the jazz age with a much “brassier” sound than past shows, Beer said.